Round 3 definitely provided a decent amount of variance amongst a few premium players due to injury, the movement in overall ranking was significant mostly based on the 32% ownership for Tom Rockliff and to a lesser extent Nat Fyfe who is 9% owned. Pre-Round 4 decisions for those negatively impacted last week will be critical in maintaining a competitive team, there is still plenty of time as we are only 13.0% of the way through the H&A season. Adelaide are averaging 395.3 Disposals this season (Rank 3), Rory Laird is averaging 7.5 fewer Disposals compared to last season. The Lions are averaging 42.0 more Disposals than their opponents this season, Lachie Neale is averaging 38.3 Disposals this season (AFL Rank 1). Michael Gibbons found little space against the Sydney defence in Round 3, he recorded just 4 Disposals. Adam Treloar is averaging 3.2 more Disposals than last season (Injury impacted), Steele Sidebottom (-5.4), Scott Pendlebury (-1.5) are averaging fewer Disposals than 2018. Zach Merrett has averaged 27.0 Disposals from his last 2 games, he averaged 26.8 Disposals last season. Luke Ryan recorded 13 Marks against the Saints in Round 3, it was the 7th time in 34 career games he has recorded 10 Marks or more in a game. Tom Stewart has scored 100pts or more in each game this season, he is averaging 25.3 Disposals (+5.2 compared to 2018), 7.0 Marks (+1.0) & 3.3 Tackles (+1.2) in 2019. Jack Bowes is averaging 94.3pts this season, that is +30.5pts compared to 2018. 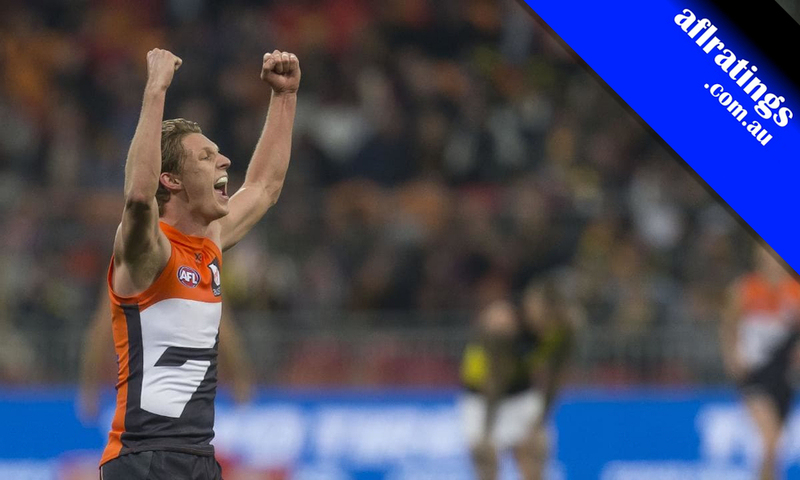 Lachie Whitfield recorded back to back games recording 10 Marks or more for the second time in his career, he has never recorded a hat-trick. In Round 1 James Worpel recorded 27 Disposals for 101pts, in Round 3 he recorded 27 Disposals for 60pts. Max Gawn has averaged 110.0pts from his last 2 games, he has averaged 48.0 Hit Outs over the same period. Shaun Higgins recorded his 3rd highest career score of 125pts in Round 3, he is averaging 105.3pts in 2019. Connor Rozee kicked 5 Goals on his way to 121pts in Round 3, his Round 4 opponents Richmond have conceded an average of 18.0 Goals in the last 2 weeks. Dustin Martin has averaged 68.7pts from his first 3 games this season, he averaged 127.0pts from his first 3 games in 2017. Rowan Marshall has averaged 107.5pts from 2 games this season, he recorded 40 Hit Outs in Round 3 and currently is FWD eligible only. Jake Lloyd is averaging 33.7 Disposals & 9.7 Marks this season, that is +5.9 Disposals & 3.2 Marks more than 2018. Andrew Gaff recorded 35 Disposals in his return game, he has recorded 30 Disposals or more in 13 of his last 17 games. Marcus Bontempelli is averaging 29.7 Disposals in 2019, that is +5.6 compared to last season. 1. Richmond have conceded an average of 1827.7pts this season (Rank 18), Half-Back type roles vs Tigers this season: R1 Nic Newman 115pts, R2 Jack Crisp 142pts, Lachie Whitfield 162pts. 2. Melbourne have conceded an average of 1695.7pts this season (Rank 17), the Demons are scoring an average of 281.0pts fewer than their opponents. 3. Travis Boak is averaging 34.0 Disposals & 7.0 Tackles in 2019, he is averaging 133.3pts (AFL Rank 2). 4. Lachie Whitfield recorded a career high 42 Disposals in Round 3, he is averaging 134.7pts (AFL Rank 1). 5. Only 2 players at Ruck are averaging more than 100pts, Brodie Grundy 105.7pts & Ben McEvoy 103.0pts. Warnie, Cal & Roy discuss these takeaways on the Traders Podcast (10:32). Hi all I am Ranked just under 6000 after Rnd 3. My Qeustion is do I Trade Two Rookies for Two Rookies (Out Gibbons and Burgess for Stack and Miers) I will have just under 200K in bank as I Traded two rookies for two rookies last week to or do I Trade out Newnes for Heeney or even Bowes? Early season you need to make money and the only way to make money is through rookies. I am ranked just under 600 and I am getting in two rookies – Stack and ? (see who is named) for probably Gibbons & either Burgess & Scott. I would like to ditch Goldy & Laird but making coin is way more important. Chatta – Would you recommend generating cash from more expensive rookies? i.e. Setterfield (be 27 av 59) to Rozee (be -27 av 88), its actually an upgrade but should generate more cash short term and indeed more points. Orima – it depends on your team and who you do and dont already have. I have a feeling Gibbons will be dropped this week and possibly Atkins & Scott and Burgess is a slow burner. I prefer to have as many players as possible playing and Setterfield has good JS. I already have Rozee. Whichever way you go rookies and cash generation are the key to success. Scrimshaw is a def. Why drop him when he still has cash to make? Waiting on the health of Rocky, Kelly and Phillips. If they’re all out I won’t make 2,000 this round, that’s for sure. I think they will all play. Phillips did her ACL. Must trade I’m afraid! If youve got other trades that need to be done in your team, id hold Goldy (as they are playing the crows and he will be up against O’brien). Sheed’s be is only 68 (average 110.7). He has a lot more cash to make (and good scores to contribute). Can you find someone else to step on to reach Whitfield. I’m doing it by trading out Witherden. He’s only $19k less than Sheed, has a be of 90 and an average of 87.3.